and by no means to does it mean Hollywood, I'm not looking to be the next big actress, though I do a pretty convincing British accent. What I'm talking about are the amass of galaxy patterns and star embossed accessories that are starting to show up on the bodies of some of the fashion elite, albeit again. Galaxy prints are technically going into its second season of stardom, pun intended, with some of my favorite designers Christopher Kane and Setareh Mohtarez creating patterns in swirls of the milky way and nebula's of other universes with different vibrant hues. 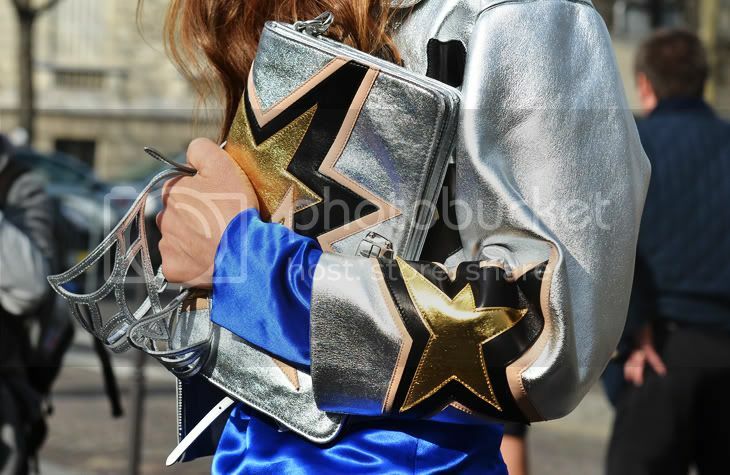 While star patterns in other forms, think metals and plexiglass which were strategically placed on shoes and necklaces of YSL S/S 2008 have their place again, embossed on clutches and jackets thanks to Miu Miu. It throws me back to my preschool days and the kitschy star shaped sunglasses we all rocked in hot pink and bright red.